Now I realize this was a mistake. What if we want to learn the truth about one of these dangerous cults? Is it enough to depend only on what the cult leader and his deluded followers say? Wouldn't it be prudent to widen our research and find out what other people have to say about them? Going to the source makes sense only in scientific matters, because scientists are not "believers". They do not say something because they have blind faith. Scientists make a critical analysis of the evidence. It is very much different from religious approach that is based entirely on faith and belief. But those who reject Faith after they accepted it, and then go on adding to their defiance of Faith, - never will their repentance be accepted; for they are those who have gone astray. There are also Hadiths that clearly says " So, wherever you find them, kill them, for there will be a reward for their killers on the Day of Resurrection." Eight men of the tribe of 'Ukil came to the Prophet and then they found the climate of Medina unsuitable for them. So, they said, "O Allah's Apostle! Provide us with some milk." Allah's Apostle said, "I recommend that you sh ould join the herd of camels." So they went and drank the urine and the milk of the camels (as a medicine) till they became healthy and fat. Then they killed the shepherd and drove away the camels, and they became unbelievers after they were Muslims. When the Prophet was informed by a shouter for help, he sent some men in their pursuit, and before the sun rose high, they were brought, and he had their hands and feet cut off. Then he ordered for nails, which were heated and passed over their eyes, and they were left in the Harra (i.e. rocky land in Medina). They asked for water, and nobody provided them with water till they died. The more I read the more I questioned the sense of Justice of Muhammad. The following is very disturbing. I dare to say that any man who reads it and is not taken aback with disgust has a long way to go to become a human. I felt the above story was a manifest injustice. Muhammad condoned a man killing a pregnant mother and his own unborn child just because he said that she insulted the Prophet! Forgiving someone for killing another human being just because he said she insulted Muhammad is unacceptable. What if that man was lying to escape punishment? What does this story say about Muhammad's sense of Justice? During the past 1400 years, how many husbands escaped punishment for killing their innocent wives by accusing them of blaspheming the prophet of God and this Hadith made them get away with it? It was not easy to read these stories and not be moved. There is no reason to believe that all these stories were fabricated. Why should believers, who have tried to depict their prophet as a compassionate man fabricate so many stories that would make him look like a ruthless tyrant? I could no longer accept the brutal treatment of those who chose not to accept Islam. Faith is a personal matter. I could no more accept that the punishment of someone who criticizes any religion must be death. The verse "The punishment of those who wage war against Allah and His Apostle, and strive with might and main for mischief through the land is execution, or crucifixion, or the cutting off of hands and feet from opposite side or exile from the land...most merciful" was revealed about polytheists. If any of them repents before they are arrested, it does not prevent from inflicting on him the prescribed punishment, which he deserves." How could a messenger of God maim and crucify people on the account that they resist accepting him? Could such a person really be a messenger of God? Wasn't there a better man with more moral and ethical fortitude to bear this mighty responsibility? A thief was brought to the Prophet (peace_be_upon_him). He said: Kill him. The people said: He has committed theft, Apostle of Allah! Then he said: Cut off his hand. So his (right) hand was cut off. He was brought a second time and he said: Kill him. The people said: He has committed theft, Apostle of Allah! Then he said: Cut off his foot. So his (left) foot was cut off. He was brought a third time and he said: Kill him. The people said: He has committed theft, Apostle of Allah! So he said: Cut off his hand. (So his (left) hand was cut off.) He was brought a fourth time and he said: Kill him. The people said: He has committed theft, Apostle of Allah! So he said: Cut off his foot. So his (right) foot was cut off. He was brought a fifth time and he said: Kill him. So we took him away and killed him. We then dragged him and cast him into a well and threw stones over him. Seems that Muhammad passed judgment before hearing the case. Also by cutting a thief's hand he is left with no other means to earn his bread except begging, which would be difficult since he is defamed as a thief and so hated by people. Therefore re-offending becomes his only means of livelihood. I also found the above statement false. The evidence is in the Bosnia and Kosovo crisis; where Christian countries, waged war against another Christian country, to liberate Muslims. Many Jewish doctors volunteered to help the Kosovar refugees, despite the fact that during the WWII, the same Albanian Muslims took sides with Hitler and helped him in his holocaust against the Jews. It became obvious to me that Muslims are accepted by all the people of the world yet our prophet wants us to hate them, to disassociate ourselves from them, to force them into our way of life or kill them, subdue them and make them pay Jizya. How silly! How pathetic! How inhumane! No wonder there is so much inexplicable hate of the West and of the Jews among Muslims. It was Muhammad who inseminated the hate and the distrust of the non-believers among his followers. How can Muslims integrate with other nations while holding these hateful messages of the Quran as the words of God? I also find the following verses completely against my conscience. I love all humanity and wish everyone to be happy in this world and forgiven in the next. But my holy prophet bade me not to seek forgiveness for the unbelievers even if they are my parents and beloved ones. It is not (proper) for the Prophet and those who believe to ask Allaah's forgiveness for the mushrikeen, even though they be of kin, after it has become clear to them that they are the dwellers of the Fire (because they died in state of disbelief). Quran and hadith are full of outrageous verses like these that to me are clear proof that Muhammad was not a prophet, but a cult leader. To force people to denounce their own family is what cults do. He was an impostor who lied so loudly and so forcefully that the ignorant people of his time believed in him. Then the following generations echoed these lies passing them to the next. Philosophers and writers were born in this atmosphere of lies and elaborated on them, embellished them, and made them credible. But when you go to the core of the religion, when you read the Quran and study the hadith you see they are nothing but pure nonsense. Rumi was a great poet and a mystic, he tried to give Islam mystical significance that it lacked. But what Rumi said is Rumi's thinkimg. Quran is bereft of mystical meanings. Muhammad's concept of religion and god was extremely primitive. Why Rumi, Attar, Sohravardi or other mystics strive to attribute meanings to senseless verses of the Quran has to do with their upbringing as Muslim kids. On one hand, unlike the more rationalist thinkers such as Ar Razi, they could not denounce Islam altogether for it was ingrained in their subconscious mind. Nothing is more difficult to get rid of than religion. This is truly the most potent narcotic if it is administered to a person from childhood. Yet as intelligent people it was not possible for these great minds to accept the Quran for its face value. Therefore they tried to find esoteric meanings in meaningless verses of the Quran and it was they who gave birth to a new religion that had nothing to do with what was taught by Muhammad. Yet this religion was palatable to those with brains. Thus we have two Islams. 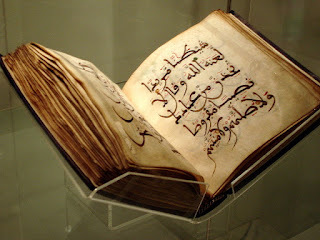 One that makes strives to attribute mystical significance and otherworldly meanings to the inane teachings of the Quran, as is professed by Sufis, and the other that rejects any interpretation of these verses beyond their literal meanings, as is practiced by the majority of Muslims with their hub in Saudi Arabia among the Wahhabis. And of course there is a myriad of sects that go in between these two extremes, each interpreting the Quran according to their own whims and caprices, each calling others mortad or heretics and constantly making war among themselves to impose their own "right" version of the pure Islam on others. However, the real Islam is not what its philosophers and mystics have inferred but what is in the Quran and that is the Islam of the fundamentalist and the terrorist. The real Islam is the Islam that abuses women, that allows men to beat their wives, that imposes penalty tax on the religious minorities, that wants to dominate the world by subduing all the non-Muslims, that calls for Jihad and killing the non-believers until Islam becomes the only dominant religion of the World. My rejection of Islam is not based on the bad deeds of the Muslims but on the bad teachings of its holy book and on the bad deeds of its founder. Many cruelties and heinous acts of violence, perpetrated by Muslims throughout the centuries were inspired by the Quran and the Sunnah (the examples of the prophet). That is why I condemn ISLAM for the bad things that Muslims do. Any effort to humanize Islam is a waste of time. The obstacle to any reform is Quran. The enemy is Islam and that is the target of my attacks. I do that, despite knowing that I have become the magnet of the hatred of fanatical Muslims and my own life could be in danger. Yet I know that by eradicating Islam we can save the world from the dangers of a catastrophe that otherwise is looming over our heads and could cause more disaster than the 1st and 2nd World Wars combined. Eradication of Islam means restoring peace among humanity and civility, democracy and prosperity in the Muslim world.